Apply today to join our network of 1,000 plus Australian volunteers and become part of the world's largest wish-granting organisation! When you join the #WishForce, you become part of the world's largest wish-granting charity - with endless opportunities to make a difference in the lives of sick kids, their families and local communities. Our volunteers give their time, skills and energy to help bring wishes to life for a variety of reasons. And importantly, to be inspired and have fun! When you volunteer with Make-A-Wish, we'll take you on an unforgettable volunteering journey - whatever your reason, explore our opportunities and get involved today. There are many different ways to lend your time and skills to help make wishes come true. Find out more about our volunteers and the types of roles available. We are a vibrant, diverse and inclusive organisation, and encourage volunteers of all backgrounds, skills and life experiences to get involved! You'll also need an email address and ability to access our online Community platform for volunteer communications and training. Make-A-Wish Australia is proud to be a child-safe organisation and we value community, integrity, innovation, impact and most importantly, we put wish children first. Our volunteer onboarding process includes background checks to ensure all volunteers share our commitment to child safety. See Volunteering Opportunities for more info about these roles and other ways you can get involved. Do I need any special skills to get started? No - there's no special skills required for most volunteer roles. All we ask is that you have a genuine commitment to making a difference, and empathy for wish children and their families. Any prior administrative, event management, fundraising, PR or project management skills are a bonus - and you'll pick up lots of new skills along the way. For volunteers involved with wish granting, it's important that you enjoy and can communicate well with children, young people and their families. Make-A-Wish provides training and support to help you do this. The time you commit to volunteer with us is entirely up to you! Most of our volunteers balance their Make-A-Wish role around family, work and social commitments. To get an idea of the effort involved with different volunteer role types, please check out our Volunteer stories. Please note, we ask branch volunteers to commit for a minimum of 12 months and attend their monthly branch meetings, where possible. Any extra time you give through the year will depend on your individual interests, the branch fundraising calendar and local wish family requirements. Whatever way you choose to help - we are grateful for your commitment and support in making wishes come true. How do I apply, and what happens next? It's quick and easy to apply - from this page, simply hit 'Apply now' and complete the online Expression of Interest form. Let us know who you are and the types of volunteering opportunities you're interested in! Our Volunteer Programmes team will be in touch to advise next steps for the type of opportunity you've expressed interest in. Please note, for non-branch volunteers, it can take some time before an opportunity comes up that matches your profile. What's the onboarding process? Are any special checks required? Yes - as a charity committed to children's safety and wellbeing, we follow a rigorous recruitment process, ensuring we place the right people in the right roles. Is training and support provided to volunteers? In short, yes! All new volunteers participate in local orientation activities, with additional online training and mentoring for branch volunteers as you get 'wish-ready'. 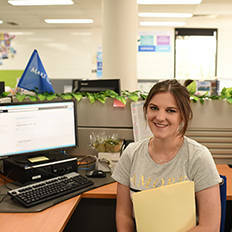 All branch volunteers have access to the Community, a dedicated online platform where you can find the latest news, training and support, and connect with other #WishForce volunteers around Australia. Leadership training and face-to-face workshops are also offered annually for branch volunteers in key leadership positions (for example, Branch Presidents and Wish Granting Coordinators). How do the volunteer branches work? At Make-A-Wish, the large majority of our volunteers (around one thousand of them!) come on board as a branch volunteer. Capturing a child’s unique wish and bringing it to life through all stages of the Wish Journey. Supporting local fundraising and events, from fun runs and sausage sizzles to gala balls and bake-offs. Raising awareness and support in the local community, helping drive our reach and impact to achieve our mission. Each branch also has a range of elected leadership roles (for example, President and Vice President, Wish Granting Coordinator, Fundraising Coordinator and Volunteer Care Coordinator). Where is my closest branch? 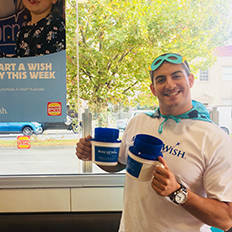 We have some incredible volunteers who give their time, passion and skills to make wishes come true around Australia. Being part of our #WishForce is one of many hats Michelle wears. 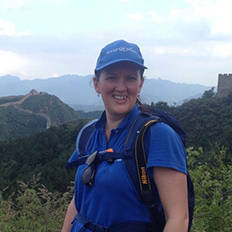 Find out how she has an impact on her own children and helps sick Australian children with every step she takes! If you want something done, ask a busy person! Roland found a way to get involved and give back that fits his busy lifestyle. He shares some of his experiences with us. Courtney's career took off, after she completed an 18-month stint with our Brand & Comms team during her studies. Before heading off, Courtney shared the inside word on her experience as an office volunteer. Make-A-Wish Australia was founded by two Ballarat volunteers in 1985. The two insurance salesmen had attended a conference in the US where they heard about the power of a wish. Back home, they were inspired to put their time, skills and networks to work, soon granting our very first Australian wish! It was for 16-year-old Shawn, who battled Duchenne muscular dystrophy and wished to see his favourite footy team in action. Seeing the positive impact his wish had on Shawn and his family was one thing - but experiencing the incredible ripple effect that spread to everyone involved inspired them to officially form the foundation. Some 30 years on, volunteering remains at the heart of our mission, helping us grant more than 10,000 wishes for children all over the country.